We took a Nikon D5100 and Sigma 150-500 f5-6.3 to a designated dark spot in the Cotswolds. 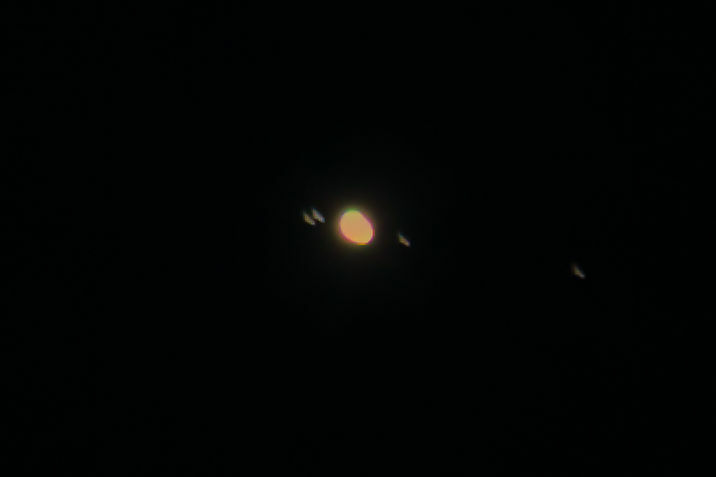 I’ve imaged Jupiter with this lens from South Manchester, at 5.1AU distance, so I figured I could get photos at least that good from a dark site, with Jupiter at 5AU distance. Just out of curiosity, I also tried to get some shots of Saturn. Saturn is ~10% smaller than Jupiter, and was also almost twice as far away (9AU distance), so I didn’t expect to get any detail – maybe an oval would be the best result I could manage at 500mm with glass optics? In the creative and poetic words of Donald Trump: “Wrong!” – Saturn’s rings are visibly distinct from the planet itself, although no moons were resolved in any of the photos I took. That’s Saturn and rings at 9AU distance, on a D5100 body and with a Sigma 150-500mm lens, processed with RawTherapee. Nice. Unfortunately 9AU is the closest Saturn gets so I’m unlikely to get a better photo with the budget equipment although I’ll take some with a 1metre f/5 Skywatcher when I get time. Jupiter’s closest approach is 4.5AU (10% closer than so I’ll also try Jupiter again with the telescope when it’s at closest approach – the Skywatcher should be able to resolve the atmospheric bands on Jupiter too. This entry was posted in Astronomy, Photography, Space and tagged astrophotography, jupiter, moons, rings, saturn, space on June 18, 2017 by Mark K Cowan.